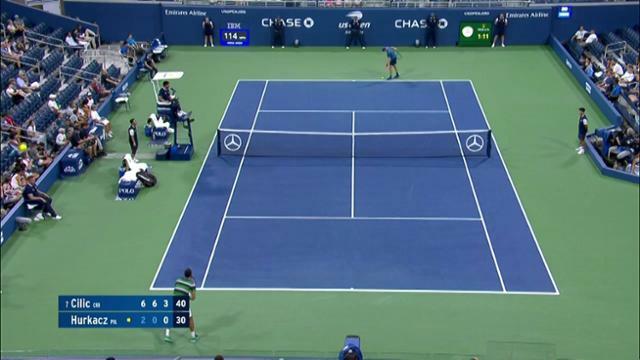 WHAT HAPPENED: The 2014 US Open champion and seventh seed Marin Cilic played “lights out tennis” to overwhelm qualifier Hubert Hurkacz 6-2, 6-0, 6-0 under the Grandstand lights on Thursday to convincingly claim a spot in the third round. "It was one of those days when everything worked incredibly well," Cilic said after breezing through the match in just 79 minutes. The opening week has been smooth going so far for Cilic. In the first round he played just more than two sets before his opponent Romanian Marius Copil retired. He even got a bit of a break in the scheduling today. While his match was slated for a late afternoon start on another hot day, it did not start until in the cool of the evening. Up next is Australian Alex de Minaur as the Croatian looks to get past the third round at Flushing Meadows for the first time since making the semifinals in his title defense in 2015. "This is where I have played my best tennis in my career so hoping to keep it going," said Cilic. It was all going against his Polish opponent on this day. Cilic was nearly untouchable on his serve. He faced and saved just two break points, fired in 13 aces and lost just seven points on his first serve. In 10 service games he dropped a total of 15 points. Off the ground Cilic was just as dominating. He cracked 34 winners against only 12 unforced errors. The lopsided match stood in stark contrast with pair's only previous meeting on the Roland Garros clay in the second round this spring when Cilic was extended to four sets by the up and coming 21-year-old Hurkacz. WHAT DOES IT MEAN: It's hard to miss somebody as big as Cilic and with the outstanding record that the 29-year-old has in the Grand Slams through his career. He has reached three major finals – losing to Roger Federer in both the 2017 Wimbledon and 2018 Australian Open. Cilic has been a French Open quarterfinalist the last two years. Yet, so far Cilic has pretty much been playing out of the limelight with both of his matches in the Grandstand. MATCH POINT: The 6-foot, 6-inch (1.98m) Cilic and Hurkacz, 6'5" (1.96 m), are two of the tallest players on the tour. August 30, 2018 - Marin Cilic in action against Hubert Hurkacz at the 2018 US Open. August 30, 2018 - Hubert Hurkacz in action against Marin Cilic at the 2018 US Open. SEE ALSO: Alex de Minaur defeats fellow young gun Frances Tiafoe 6-4, 6-0, 5-7, 6-2.to set up a meeting against 2014 champion Marin Cilic in Round 3 of the US Open.